Over the last year, across the world, the wealthy seeking to be healthy have had a new obsession: superfoods. Typically these foods are exotic, low on calorie, high on nutrients and cost the sky. Enthusiastic endorsements by people like Julia Roberts and Gwyneth Paltrow have reinforced the craze. A tiny bag of quinoa could cost Rs 2,000. A kilo of kale leaves Rs 700. And 100 grams of chia seeds could hit you for Rs 400. But the costs have not proved a deterrent for those seeking healthier lifestyles. In fact, quinoa - a gluten-free, high-protein grain - has become so popular, its global prices have put it out of the reach of those who grow it. This is super ironic because, while rich Indians are emptying their wallets chasing these fads, India itself has a fascinating homegrown range of superfoods. They are cheap, easily available and have exactly the same health benefits. Unfortunately, no one seems to know of them. 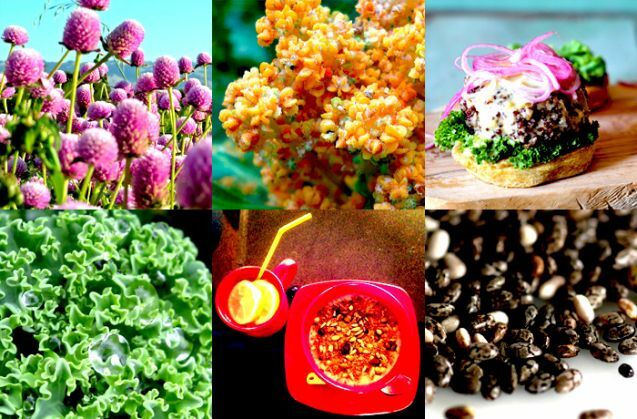 Our grandmothers have probably eaten these superfoods all our lives. All they need is someone smart to rebrand them and they would become the rage. Stop at an upscale market like Modern Bazaar in Delhi, and you are bound to find tiny packets of quinoa flying off the shelves. Quinoa has that elusive 'complete protein' cred to its name, but that's not all; it also has high levels of fibre, calcium, phosphorous and iron. With the highest overall antioxidant activity, you can imagine why quinoa is all the rage. Antioxidants neutralise those unstable molecules in your body that can lead over time to diseases such as heart and liver disease as well as cancer. But the Indian alternative is just as good, at a fraction of the cost. It's called Amaranth, it's part of the same plant family, and is known for providing the exact same nutritional properties. According to research, both quinoa and amaranth have an equal amount of protein. The two have so much in common, in fact, that they are often confused with each other. Unlike quinoa, amaranth can be added to a variety of Indian dishes, from halwa and kheer to rotis and chikki. Amaranth greens can also be used instead of spinach in many dishes, and it makes for a delicious addition to raita. At high-end dining tables, the vegetable kale is the new multivitamin wonder. "People have starting asking for kale recently, because it is considered nutritious," says a supervisor at Basant Lok's Le Marche, another high-end chain of grocery stores. "Oddly though, most people who buy these foods aren't quite sure how to cook with them," says Rohit Sachdeva of Evergreen in INA Market, a Delhi hub for exotic fruit and vegetables. America's new favourite four-letter word, kale is a green leafy vegetable that contains cancer preventive nutrients. If 'cancer-preventive' isn't good enough for you, then consider kale's crazy high amounts of micronutrients - Vitamin A (98% of the body's daily requirement in a 150 gm serving), Vitamin C (71%), Vitamin K (1180%) and manganese (27%). These micronutrients are typically low or simply missing in the food we eat, especially in the cities, which makes kale all the more attractive. At Rs 500-700 per kg in Delhi supermarkets, and a more modest Rs 200-300 at INA Market, kale comes in two varieties - curly and local (the latter variant is now grown to cash in on the obsession). Its popularity notwithstanding, it is an acquired taste, slightly bitter and is hard to use in Indian cooking. In the west, it largely eaten sauteed, steamed or boiled, dehydrated as chips, and, of course, in salads and juices. So it's curious that kale's excellent alternative isn't talked about more. Cabbage - yes, cabbage - belongs to the same cruciferous family as kale and offers many of the same benefits for which kale has become iconic. As a bonus, cabbage's high potassium content helps reduce cholesterol. Ayurveda, it turns out, ratifies this claim; cabbage is frequently referenced for its ability to draw out toxins from the body. While no single vegetable may match kale's flavonoid counts - flavonoids have excellent antioxidant effects - a few common veggies or fruit are all you need to absorb these benefits as well. Fruits such as plums and vegetables like tomatoes, okra, green onions and eggplant contain healthy doses of flavonoids. The unexpected star of the mint family that people can't stop talking about and eating is the chia seed. The seed is notable for its high Omega 3 fatty acid content, otherwise sourced most commonly from fish. Omega 3 plays a huge role in overall health - especially brain function, the heart, joints and the immune system. Chia has been a staple in Mexico's diet for decades, but has now found cult global favour, appearing in smoothies, on salads and yogurts, baked into breads and health bars, as well as in breakfast cereals. There's only one plant source in the world that beats chia on the Omega 3 fatty acids scale, and your grandmother probably ate it every day. Flaxseeds - local name alsi - has higher quantities of poly-unsaturated fatty acids and mono-unsaturated fats, than chia. Both these fats are considered great for controlling cholesterol and for the heart. What's common to both seeds are their high protein and fibre content - helpful in preventing colon cancer - but flax has the additional benefit of phytoestrogens, making it nature's answer to hormone replacement therapy. Phytoestrogens are also said to ease the unpleasant effects of menopause, such as flushing and night sweats. As opposed to paying Rs 400 for 100 gm of chia, half a kilo of flaxseeds go for as little as Rs 120. Flaxseed can be used much the same way as chia, i.e. in puddings, salads, muffins and smoothies. You could also use it in an au naturel mouth freshener with sesame and fennel seeds, in chutneys as well as roasted and ground up in roti flour. Possibly the most dubious aspirant to the 'superfood' label, Goji berries are nevertheless now famous the world over. Touted as the 'fountain of youth', the Chinese have eaten goji berries for centuries in a bid for longevity. The berry is certainly an excellent source of Vitamin C, beta-carotene and antioxidants, and studies show that it does everything from slowing the growth of cancer cells to countering diabetes, high blood pressure, fever and age-related eye problems. Normally sold in dried form, a 300-500 gm packet of Goji berries can cost anywhere between Rs 1,000-2,000. They are typically soaked in water, then added to cereals, salads and yogurts or processed into juice. There are, however, quite a few local alternatives that offer similar benefits, of which the amla is the clear winner. Amla, or the Indian gooseberry, is one of the world's cheapest and richest sources of Vitamin C; according to a 2011 study, amla has 600 mg Vitamin C per 100 gm - about 20 times higher than orange juice. The study also shows that amla enhances food absorption, balances stomach acids, helps the urinary system, strengthens the heart and lungs, regulates digestion, enhances fertility and is anti-carcinogenic and antioxidant in nature. Essentially, why aren't we all eating amla and shipping it globally as the next big superfood? Using amla in Indian cooking is fairly easy; it can be added to chutneys, pickled or made into murabba. Grating a bit of the berry into dal and vegetables adds all the benefits it offers without overwhelming you with sourness. Avocado may be the only imported superfood that may not have an equal counterpart in India. Avocado lowers cholesterol and triglyceride levels while also increasing the levels of good cholesterol (HDL) - all important for preventing heart disease. According to World's Healthiest Foods, avocado has high-fibre content (40% fibre in one 150-gm serving). It also has 21% potassium (helpful in controlling blood pressure), 35% Vitamin K (for blood clotting and strong bones) and 30% folate (crucial for cell repair). It also contains antioxidants lutein and zeaxanthin that are good for the eyes. While there's no shortage of Indian herbs and foods known to lower cholesterol-including aloe vera and camphor - they're typically used as medicines, though aloe vera is pickled in parts of the country. Camphor, interestingly, belongs to the same plant family as avocado and improves blood circulation while decreasing cholesterol levels. Other potassium-rich foods like apricots (33%), bananas (10%), spinach (16%) and potato (15%) can be subbed on the protein front, while walnuts, guavas, pears and many beans offer a combination of high-fibre cholesterol-fighting abilities that the pricey import does. So before you're tempted to overspend on glitzy superfood imports, try the timeless Indian alternatives that are equally delicious and fortifying. Ria Gyawali is a freelance photographer and writer based in Kathmandu.